MOTIVATED SELLER! Welcome to 36 Felters Road, a wonderful home with a brand new roof. Newer hot water heater, Furnace replaced in last 10 years, and new central air conditioning. Nice level backyard is partially fenced with a wooded area to the left. Gleaming Hardwood floors throughout. Don't miss this great opportunity, come and see it today! Seller is Licensed RE Agent. Benjamin Franklin Elementary School Pre-School, Elementary School / Public 1 0.79 mi. Binghamton High School Pre-School, High School / Public 3 2.22 mi. East Middle School Middle School / Public 2 1.16 mi. Calvin Coolidge School * Pre-School, Elementary School / Public 4 0.82 mi. St John The Evangelist School * Pre-School, Elementary School / Private N/A 1.7 mi. Theodore Roosevelt School * Pre-School, Elementary School / Public 1 1.86 mi. 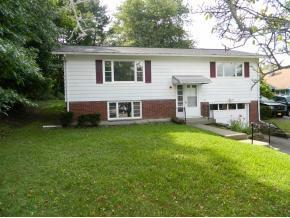 36 Felters Road, Binghamton, NY 13903 is a 2 bedroom, 1.5 bath single family home was sold for $55,000.